Cloud-based M&A premiums may be falling as investors anticipate deals. Updated to reflect added BMO analyst commentary starting in eighth paragraph. NEW YORK ( TheStreet) -- Cloud-based deal premiums are falling as investors correctly anticipate acquisitions by large technology players and analysts independent software specialists face growing competition in the hot sector. In early December, SAP ( SAP - Get Report) bought a cloud-based human resources SuccessFactors ( SFSF at a 52% premium, leading to speculation of other M&A targets. Thursday's announcement that Oracle ( ORCL - Get Report) is buying Taleo ( TLEO for $1.9 billion at an 18% premium signals that premiums are going down as investors anticipate future deals and competition ratchets up. When SAP's $3.4 billion SuccessFactors acquisition was announced, analysts like Karl Keirstead of BMO Capital Markets pointed to other possible deals, anticipating that larger tech companies would continue to look at acquiring specialists in the cloud space as their services come in increasing demand in a mobile business world. In fact, Keirstead just about nailed Thursday's Taleo purchase by Oracle. "The cloud software sector is being consolidated faster than we were expecting, and in our view, most investors will likely conclude that Taleo is the most obvious acquisition candidate and that Oracle is the most obvious buyer," wrote Keirstead in a Dec. 5 note that gave Taleo's stock an "outperform" rating and a $40 a share price target. To his credit, Keirstead even downplayed the notion that Salesforce.com ( CRM would be acquisitive and that Workday would be an M&A target. On news of the Success Factors deal in December, Taleo shares spiked 20% higher and others in the cloud and human resources software space like Kenexa ( KNXA, Saba Software ( SABA and Cornerstone OnDemand ( CSOD - Get Report) saw similar gains. Those companies' shares showed muted gains after Thursdays deal, signaling a cooling of M&A expectations in the sector and premium priced valuations. So the big question for investors who are still bidding up the price of Kenexa, Saba Software and Cornerstone OnDemand shares is whether deal activity will continue and if premiums have crested? Falling valuations on a fundamental basis may signal that premiums have topped out. Oracle's Taleo offer represents a premium of 5.1 times Taleo's 2012 projected revenue, according to FBR Capital Markets analyst David M. Hilal. Previous deals for RightNow and SuccessFactors were cut at 5.5x and 7.9x revenue valuations respectively, calculates Hilal in a Thursday note. His findings are compelling: " The decisions by RightNow, SFSF, and Taleo to sell may have been motivated by a belief that either their product reach was too narrow, too highly penetrated and that the cost of building an integrated suite was simply too high," notes Keirstead, who adds that large customers may increasingly be targeting the integrated services of larger players like SAP and Oracle. While Oracle's Taleo purchase strengthens the case for acquisitions by major players, it also may represent a turning point for investors looking to get outsized gains by anticipating M&A. Overall, Oracle's $46 a share offer for Taleo represents a 18% premium, lower than SAP's 52% premium for SuccessFactors, IBM's ( IBM - Get Report) 57% premium for DemandTec ( DMAN and Oracle's previous purchase of RightNow ( RNOW at a 19% premium. IBM and SAP's December purchases signaled that premiums were rising, Oracle's February deal may be an indication that premiums are now falling. Prior to earlier deals, Taleo shares hovered in the low $30's, however they spiked over $40 on anticipation that other acquisitions could happen in the space. Without that boost, Oracle's Thursday acquisition would represent a near 50% premium, in line with previous deals. Keirstead notes that the appetite for cloud growth may now be whetted. "SAP and Oracle have now selected their dancing partners in the HR space and in our view the likelihood of either mega-vendor acquiring Cornerstone, Kenexa, Saba or Ultimate Software now seems low," he adds. Still, cloud-based HR solutions are a growth industry, even if profitability expectations for independent players damper. Meanwhile, vendors like Salesforce.com, Jive Software ( JIVE and NetSuite ( N offer differentiated products that aren't as vulnerable to competition. 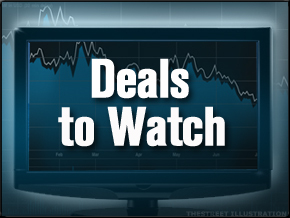 After Thursday's deal, some analysts continue to anticipate deals, even if premiums drop. "Expect SaaS M&A could continue," writes UBS analyst Brent Thil in a note. He sees Concur Technologies ( CNQR may become the target of a larger technology player or even a non-technology business solutions specialist. "The recent M&A activity in the Cloud/SaaS sector is being driven by a seismic shift to cloud computing, in our opinion. We are roughly 10 years into this shift, which should last another 10-20 years," writes Jeffrey Houston of Barrington Research in a Jan. 23 note on the sector. He recommends SPS Commerce ( SPSC - Get Report) and RealPage ( RP - Get Report) as attractively priced. Meanwhile, a wide array of specialist cloud-based H.R. service providers will also help to push Oracle's second acquisition through, signaling that consolidation doesn't create antitrust issues. "Given the many other competitors in the HR market, including SAP, Workday, Kenexa, etc., we do not expect any regulatory hurdles to getting this deal done," writes Jayson Maynard of Wells Fargo in a Thursday note. He believes the deal is consistent with Oracle's strategy, filling a "much needed product gap." However, with a big recent share rally and competition racheting up, investors should now temper their expectations on M&A premiums. In fact, that may have been the case in December when Taleo rallied on takeover speculation. "While the SaaS stocks may get a near-term boost from the SAP news, analysts should also be questioning whether the consolidation activity is a sign of a top," wrote Keirstead of BMO Capital Markets in his Dec. 5 note. For SuccessFactors and its 52% premium takeout, Keirstead concluded that it may have represented a peak as a result of increasing industry competition. Watch for premiums to fall if investors continue to bid up sector shares on takeover speculation, valuations fall and others sell out of the competitive cloud services market. Interested in more on Taleo? See TheStreet Ratings' report card for this stock.